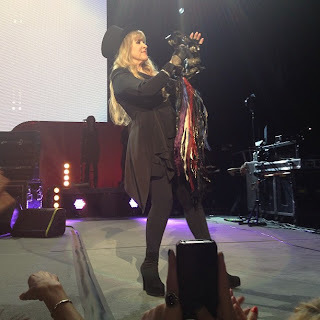 Fleetwood Mac News: REVIEW: "Stevie Nicks charisma as breathtaking as ever". "Lindsey Buckingham is one hellacious guitar player". 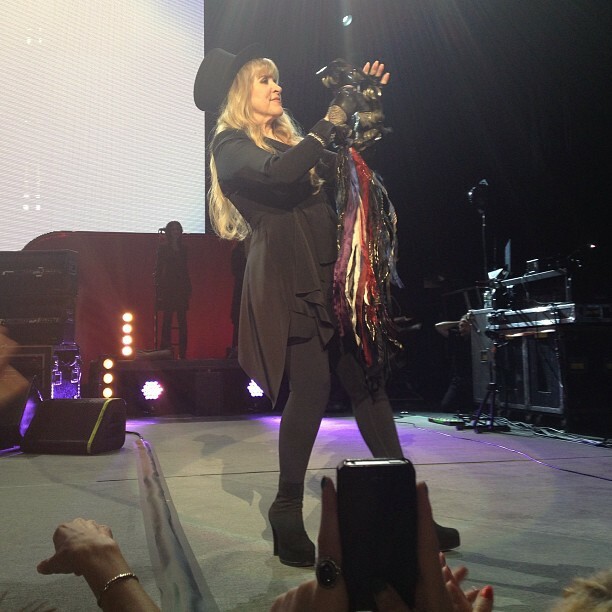 REVIEW: "Stevie Nicks charisma as breathtaking as ever". "Lindsey Buckingham is one hellacious guitar player". Fleetwood Mac's 2013 Live Tour is said to be celebrating the 35th Anniversary of their iconic "Rumours" album, but their two-and-a-half hour concert Friday night before about 19,000 fans at the Comcast Center in Mansfield (close to, but not quite a sellout) included much more. The quartet, enhanced by two extra musicians and two harmony vocalists, performed a healthy cross-section of their vast catalog, as well as a new song, and an old one most of us hadn't heard before. Publicity for this tour noted that it includes original members John McVie on bass and Mick Fleetwood on drums, both of them dating back to the band's 1967 founding, as well as 1975 recruits Lindsey Buckingham and Stevie Nicks. There was no mention of McVie's former wife, Christine McVie, who'd joined the band in 1970 and retired from the road in 1998. So it was not a surprise that last night's show didn't include a lot of Christine McVie songs, and while the band did do nine tunes from 'Rumours," they did not play three Christine McVie-penned numbers from that album, including "You Make Loving Fun." But since we're talking about an album that sold somewhere between 40-50 million units worldwide, there were still plenty of Fleetwood Mac nuggets to play. John McVie and Fleetwood came out of a blues-rock background, of course, while Buckingham and Nicks came out of the California singer-songwriter mode, and their joining pushed the band into a more pop direction. Christine McVie added a bit of English folk roots, which only added to the band's intriguing mix back in the day. The setlist this year is heavily skewed towards Buckingham and Nicks numbers, and that's fine, making for some galvanizing rock moments. The main quartet was placed center stage, with the two vocalists on a back platform at stage right, while the two extra musicians--either both on guitar, or with one on keyboards--played on a back platform at stage left. If there was one overriding impression Friday night's concert left, it was that Buckingham is one hellacious guitar player, and his incendiary solo on the ten-minute version of 1975's "I'm So Afraid" was easily the evening's high point. That song, originally just a 'B-side' to the hit "Over My Head" from the album just before "Rumours," began as a sweeping ballad accented by Fleetwood's heavy rimshots, before Buckingham yanked it into the stratosphere with a torrid cascade of notes, including some subtle use of undertones/overtones, as the rhythm section drove him on with ever accelerating tempos. That solo climaxed with Buckingham flailing away at the highest possible note on the guitar, before sliding back down the fretboard with a technique that resembled karate chops. It was simply a spectacular rock 'n' roll moment, overshadowing some excellent music that followed, and confirming Buckingham's status as a bonafide shredder of the first order. Nicks was also in fine form, her voice a bit more raw than in her prime, perhaps, but her charisma as breathtaking as ever. At this point, her stage quirks, from mid-song twirling to wandering offstage when she's not singing, her mystic aura, and her non-sequitur song intros are just endearingly goofy, and the audience seemed to embrace her with a "Well, that's Stevie" attitude. Nicks tried to explain how the old tune "Without You" was once a Buckingham-Nicks demo cassette which they'd lost, then recovered, and recently re-discovered by finding it on YouTube. The larger point was that tunes like that had convinced Fleetwood to add them to the band back around '74. Nicks noted that the old Mac had needed a lead guitarist, "but there was no mention of his hippie girlfriend," and Buckingham had persuaded the British band to take them as a pair. Expressing her eternal gratitude to Buckingham, Nicks also noted that McVie's reaction had been "just take the girl!" It was a warm and funny anecdote, made even more so by how hopelessly tangled up she got in telling it, with Buckingham and Fleetwood having to add pertinent details to keep her on track. And the song, once they got around to playing, was the kind of gently bumping folk-rock that, combined with some of the old Mac muscle, would lead to some of the 1970's biggest hits. Lots of bands celebrating old albums play them front-to-back, but Fleetwood Mac diverted from that easy path. They did start out with a marvelous three-song sequence of "Rumours' tunes however, from the rumbling "Second Hand News" to the gripping, bass-heavy thunder of "The Chain," and then into a superb take on Nicks' "Dreams." But then Buckingham introduced a new tune, noting the band has a new four-song EP out and has recorded some new material with an eye towards a new album in the near future. "Sad Angel" was a fast-paced rocker, sung by Buckingham and skittering along what seemed to be a frenetic shuffle beat. Nicks did an impressively vibrant "Rhiannon," raising the strands of a black shawl with her arms to signify the tune's surreal nature, and ending it with a nice bit of improv vocals. The spotlight kept shifting back and forth between the two front persons, with Buckingham introducing some songs from 'Tusk," the more experimental followup to "Rumours" that he conceded probably stunned their record company. The first chestnut from "Tusk" was surely a departure from the smoothness of 'Rumours," as Not That Funny" featured jagged guitar lines over a big beat. Then of course the title cut was all rumbling, barely contained angst, as "Tusk" seemed to embody all the romantic upheaval that had best the band during those days. Nicks noted that the band hadn't been doing "Sisters Of The Moon" since about 1981, and while the tune certainly had its rhythmic flow, and Nicks' own patented world-weary waif vocal was spot on, something was a little off. Perhaps it was just the harmony vocals, which were alright, just not as stellar as they were with Christine McVie's voice in the mix. At any rate, at the song's finish, Nicks embraced Buckingham for a long moment in one of the evening's more touching scenes. Buckingham sang "Big Love" solo, with just acoustic guitar, as his mates took a break. With his blazing finger picking and the passionate howl in his voice, that was Buckingham at his most brilliant. Nicks came back out to do a lovely acoustic duet with Buckingham on "Landslide," and then they combined again for a riveting rendition of "Never Going Back Again." It's a measure of how solid those songs are that they can be so compelling in almost any format, and the acoustic interlude was really fabulous. 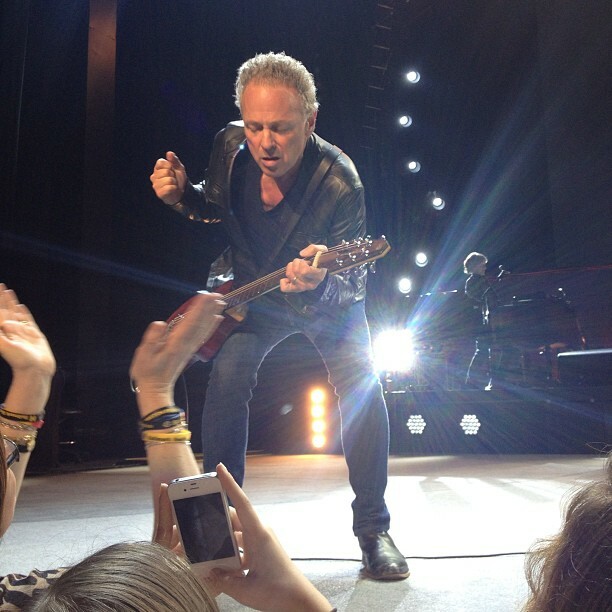 That led into the band's return and Nicks' convoluted intro to the new/old "Without You." A sweetly swirling run through "Gypsy" was another special Nicks vehicle, contrasted right after by Buckingham's rowdy gallop through "Eyes of the World," from their 1982 "Mirage " album. The haunting tones of Fleetwood's gong introduced "Gold Dust Woman," with Nicks adding extra tinges of mystery, and finishing the tune, back to the crowd, holding aloft a white shawl which made her resemble a butterfly. After Buckingham set heads a-spinning with his tour de force on "I'm So Afraid," Fleetwood Mac did a fiery version of "Stand Back," one of Nicks' signature solo hits, and if there was a woman in the throng who wasn't singing along, we didn't see her. The hard driving Fleetwood Mac rumble was back for a bracing charge through "Go Your Own Way," and Buckingham changed it up a bit by playing his guitar solo on the lower strings, even as Fleetwood fired off his rapid drum patterns with a maniacal grin. The first encore was the rhythmic potpourri "World Turning," featuring the predictably wacky Fleetwood drum solo--he's obviously still having a blast performing. The slightly ramshackle but utterly joyous "Don't Stop (Thinking About Tomorrow)" that ended the first encore was everything music fans love about the band; disparate parts coming together and creating something unforgettable. This tour has featured "Silver Springs" and "Say Goodbye" as the second and final encore, but after the blazing Buckingham turn on "I'm So Afraid," Nicks' triumphant "Stand Back," and that wondrous "Don't Stop," the band had already reached the heights. Note: corrected the reviewer changing the title of "Looking Out For Love" to "Big Love" and changing "Sara" to "Sisters of The Moon".